The leaves, vines and berries are of a single stone. Green and Brown Jade. 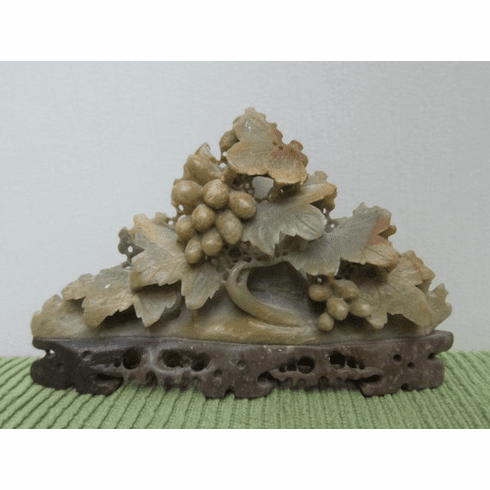 The base is of a darker brown jade. There are some small areas of translucence in the green and brown jade. Condition: There is one tiny white mark - chip - on the bottom left leave. You can see it in the photos. No chips. No Repairs. Markings: "Le" is on the bottom. I keep a "Wish List" for people who are looking for pieces such as this one. If you would like to be on this list, please send a note and, if I do happen to find the item(s) you are looking for, I will send a note back. Please Note: This item is listed both here, in this independent online shop and, in my Etsy shop www.RusselAvenueWhimsy.Etsy.com ~ I only have one of these and when it sells from one shop, it will be marked as sold in both shops. Shipping: Please note that this item will need a sturdy box to ship safely in. When choosing a shipping option, please choose the 'Package, Priority or Express' option that is best for where you are located or, choose "Bill Me," include your postal code (country, state, etc.) and.... see payment options for more details. Payment Options: Paypal (your choice of currency) to purchase this item immediately or, choose "Bill Me" and I will send a PayPal Invoice in your preferred currency or a Square Invoice (Canadian Funds only). The "Bill Me" option also works if you would like me to get the best shipping rate for your order. Custom Shipping Requirements and Requests can also be made using the "Bill Me" option.